The 18 experts at a meeting GAO convened with the National Academies of Sciences generally agreed that the Nuclear Regulatory Commission (NRC) assessment of risks of radioactive material does not include all relevant criteria. NRC limits its criteria to prompt fatalities and deterministic health effects from radiation, which, according to the experts and recent studies, are unlikely to result from a radiological dispersal device (RDD). Two studies from Sandia National Laboratories (Sandia) measuring consequences of RDDs, released in 2017 and 2018, found that there would be no immediate fatalities from radiation. The experts at the meeting generally agreed that socioeconomic effects (e.g., relocations and clean-up costs) and fatalities that could result from evacuations are the most relevant criteria for evaluating the risks of radioactive material. 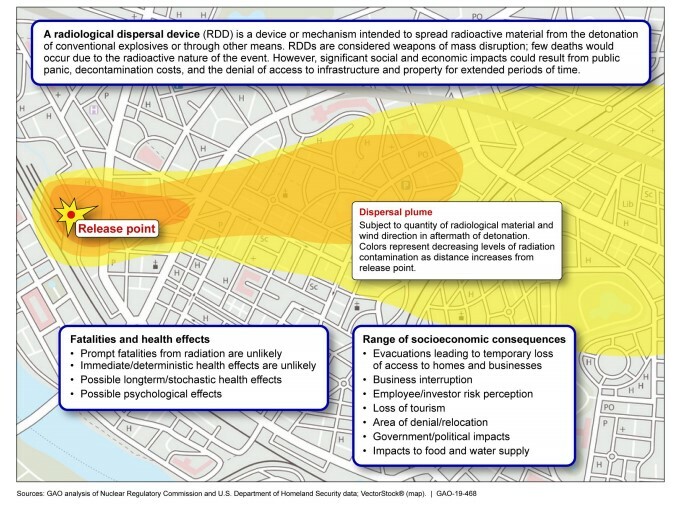 The two Sandia studies found that a large RDD could cause about $30 billion in damage and 1,500 fatalities from the evacuation, and a considerably smaller RDD could cause $24 billion in damage and 800 fatalities from the evacuation. By considering socioeconomic impacts and fatalities resulting from evacuations in its criteria, NRC would have better assurance it was considering the more likely and more significant consequences of an RDD. For example, a 2018 study from Sandia found that malicious use of certain radioactive materials in smaller quantities could cause significant socioeconomic consequences. By requiring additional security measures for these smaller quantities of high-risk material, NRC can have better assurance that its security requirements are sufficient to secure all high-risk radioactive material from theft and use in an RDD.